The sources must have the same frequency and polarization. In the double slit experiment, a single source is split in two, to generate two coherent sources. To explain the origin of the interference pattern, consider the distance traveled from the two sources. At the center of the screen the waves from the two sources are in phase. As we move away from the center, the path traveled by the light from one source is larger than that traveled by the light from the other source. When the difference in path is equal to half a wavelength, destructive interference occurs. Instead, when the difference in pathlength is equal to a wavelength, constructive interference occurs. 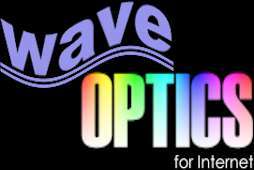 This Java applet demonstrates a classic example of interference effects in light waves. Two light rays pass through two slits, separated by a distance d and strike a screen a distance, L, from the slits. You can change this parameters (drag scrollbars to do it) and you see the result of interference on the screen. If you like this applet you might want to try a newer version. Visit Interference page. Online Physics Simulations. Fundamentals of Physics. This is a Java applet designed for science education. University education.